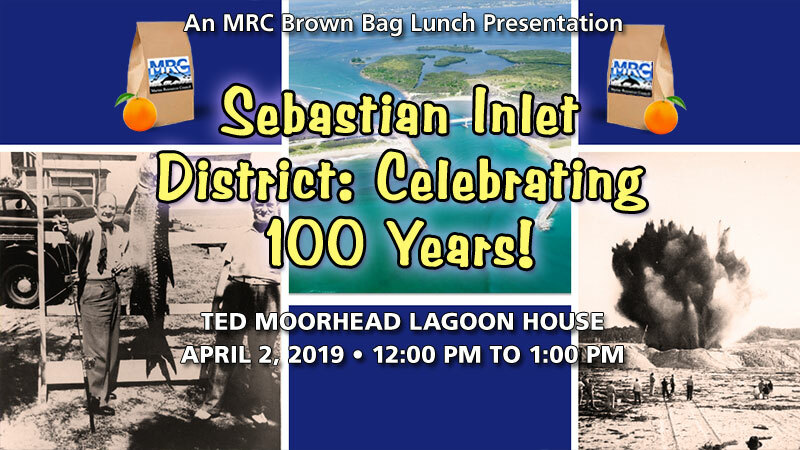 MRC’s April Brown Bag presentation features Michelle Malyn, Public Information Associate at the Sebastian Inlet District, who will outline the history of the Sebastian Inlet and its importance to us today. The earliest settlers began arriving in the Sebastian River area in the mid-1800s, and by all accounts, there were multiple attempts to open a “cut” or an inlet on the barrier island to the Atlantic Ocean. Following six substantiated attempts, dating from 1872 to 1905, the Sebastian Inlet District was created as an independent special district by the Florida State Legislature on May 23, 1919 chartered to maintain a channel connecting the Indian River to the Atlantic Ocean. Learn more about the fascinating history of the Sebastian Inlet filled with trials of the earliest settlers, tales of sabotage, and the pioneering spirit that eventually led to the permanent opening of the Sebastian Inlet as we know it today. The Sebastian Inlet District is governed by a 5-member elected Commission and its responsibilities include beach renourishment as part of a state mandated bypass system, erosion control, environmental protection and natural resource preservation, and public safety. The Sebastian Inlet supports a rich and diverse ecological environment that is unparalleled in North America. The inlet is vital not only to the ecological health of the Indian River Lagoon, but it is also an important economic engine for the region. Known as the premier fishing, boating, surfing, and recreational area on the east coast of Florida, the Sebastian Inlet is one of only five navigable channels that connect the Indian River Lagoon to the Atlantic Ocean. Michelle Malyn is the Public Information Associate at the Sebastian Inlet District. She has almost 20 years of experience as a marketing communications professional and has worked in both the non-profit and corporate sectors. An “almost native” Floridian, Michelle grew up in Melbourne Beach, graduated from the University of Florida with a B.S. in Public Relations from the College of Journalism & Communications, and has lived in Brevard County with her husband and two dogs since 2004. This event is free and open to the public; all attendees have to do is register online. If interested and able, we ask participants to donate $5 toward our guest speaker series. This educational series is a long-standing and cherished program of the MRC that is supported by volunteers and the community’s charitable giving. All donations are tax-deductible. Attendees are encouraged and welcome to bring and enjoy their lunch during the seminar! For more information on the Marine Resources Council, please visit www.SaveTheIRl.org.